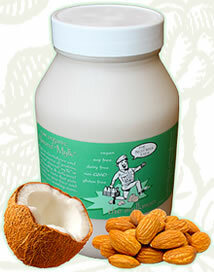 This delicious drink is made with soaked raw organic almonds from Italy and the water from freshly cracked coconuts. This raw almond milk is phenomenal! Everyone LOVES it! It�s an addictive, healthy, raw alternative to dairy. Mylkman delivers directly to some areas of Los Angeles. Click here for his website.